I do a lot of things. I'm a doer. I like doing lots of things. But I want to make sure that I'm doing all those things well. I don't like doing things half way or not being good at the things I'm doing. I saw Frank Bealer's book at The Orange Conference. Orange is a ministry conference I get to attend with cLife's Kids Ministry team each year. It's a small book but it intrigued me. How can I do all the things and do them well? As you might has guessed by the name, Bealer doesn't believe that balance is possible. It's a myth. Rather you have to handle things as they come. Sometimes home life is most pressing. Sometimes you have a big project at work. The key is to have a plan. I like plans. I can roll with plans! When you plan ahead you're able to keep the most important things most important. I don't want to give the book away but, Bealer has this great formula - When This, Then That - to help you decide, in advance, what your plan will be! To me, the beauty of the When This, Then That plan is that it eliminates guilt. Mommy guilt is real. I've struggled with it BIG time this year. But if you have a WTTT plan, you've already decided what you'll do when work needs to be a bigger priority. It's just a fact of life. Mommy guilt assuaged. 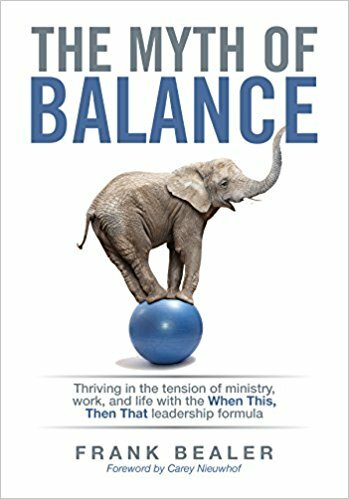 The Myth of Balance is a short easy read with questions and space to work out your balance issues. Bealer focuses on life in ministry but the formula can be applied to any situation. There are lots of examples and guidelines to help you create your own When This, Then That strategies. I highly recommend this for working mommies. Work out your strategies and enjoy all the things God has called you to do! We are meant for a full life, not a life full of guilt! You can get The Myth of Balance from Amazon here. Or directly from Orange here. I don't make a thing, I promise. To see all the books I'm reading this summer you can read about my TBR (to be read) pile here. Let us know what you're reading this summer in the comments or on FB or Twitter.